By Chris Williams: 33-year-old Jorge Arce said he ending his boxing career after getting blown out in a 3rd round TKO by WBO super bantamweight champion Nonito Donaire in Houston, Texas. Donaire hit Arce with a scorching left hook to the head that knocked him out in the 3rd round. Arce was already badly hurt at the time after getting knocked down moments earlier in the same round. Donaire ended up knocking the little 5’4” undersized Arce down three times in the fight. This mismatch was just like the mismatch that Bob Arum put together between Manny Pacquiao and an over the hill 40-year-old Shane Mosley last year. Why these two fights were put together is beyond me, because they weren’t fan friendly fights in terms of being competitive. I think it’s bad for boxing to have mismatches like Donaire-Arce put together, because it’s not interesting to watch, and it gives a false impression about how good guys like Pacquiao and Donaire really are. We just saw Pacquiao exposed when he had to step it up and fight someone good, and I suspect the same thing will happen one of these days when Arum finally puts Donaire in with quality fighters like Mares and Guillermo Rigondeaux. It’s too bad Arce had to end his career with this fight instead of a win. However, as most boxing fans already know, when a fighter says he’s retiring it’s usually a case of the fighter taking a vacation and then coming back later on. I think we’ll definitely see Arce back in the ring if one of the promoters offers him a good payday, and that’s going to happen because Arce is really popular. There really wasn’t much for the large Mexican crowd to root for last night at the Toyota Center, and in hindsight, Bob Arum, the promoter who put the mismatch together between the way past his best Arce and a prime Donaire, didn’t do the large crowd any favors. It was kind of like the mismatch that Golden Boy Promotions put together in Los Angeles, California on the same night between Amir Khan and the Mexican American Carlos Molina. 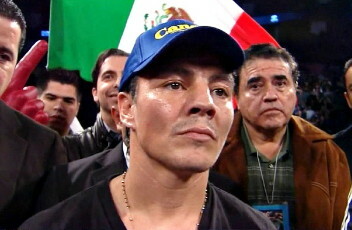 Most of the fans who showed up for that fight where likely Mexicans looking to see what Molina would do, but he didn’t have a chance in that fight. The same goes for the Donaire-Arce mismatch. I have a lot of respect for Arce, but this wasn’t a good match-up for him by putting him in with a much bigger, younger, faster and more powerful Donaire. I would have liked to have seen a more competitive fight put together with Donaire fighting Abner Mares, who is a legit super bantamweight, and Arce fighting someone his own size at super flyweight. It would have been perfect. I would have been embarrassed to do that to him if I were a promoter just out of respect for him. Arce is better off fighting guys at super flyweight at this point in his career because he’s not a super bantamweight in terms of size. They’re talking about making Donaire fighter of the year for his wins over Jeffrey Mathebula, Wilfredo Vazquez Jr, Toshiaki Nishioka and now Arce, but I don’t think those wins deserve making Donaire fighter of the year. Nishioka and Arce were both arguably shot fighters at the time Donaire fought them, and Mathebula was considered a paper champion by a lot of boxing fans. Donaire’s win over Vazquez Jr. came against a fighter that had been beaten by Arce by a 12th round knockout not long before that fight. Those aren’t impressive wins to me. These are the fighters who I see as the best in the super bantamweight division right now, not the guys that Donaire has been beating in an old Nishioka and Arce, as well as Mathebula and Vazquez Jr.